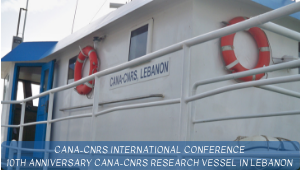 On the occasion of the 10 years anniversary of the CANA-CNRS Research Vessel in Lebanon, on 27 March will be held an International Conference at the headquarters of the Grand Serail (Government Palace). Ten years ago, the CANA-CNRS Research Vessel, a valuable donation of the Italian Government in 2009, opened up a vast field of research in marine studies and coastal oceanography for scientists in our country. Stemming from the desire to enhance sustainable coastal development and to prioritize the study of marine eco-systems in Lebanon, and through the great efforts of CIHEAM Bari (within the TerCom collaborative project), the first steps were initiative towards the acquisition of a fishing trawler, undergoing a complete refurbishment of the engine and hydraulics and equipping the vessel with essential laboratories, training rooms and scientific equipment to fully transform the vessel into today’s CANA-CNRS Research Vessel.